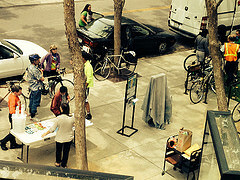 May is National Bike month, and we decided to do it up right with a book display, two bike-focused programs (both urban skills classes), and participating in both Bike to Work day and Bike to Shop day. Penn’s story of his search for a new bike, and the larger story of how bikes have changed and changed us, throughout their history. The Bike Deconstructed : A Grand Tour of the Modern Bicycle. Richard Hallett. Princeton Architectural Press, 2014. A bit-by-bit look at all the parts of a bicycle, clearly written and extensively illustrated. The Bicycle Commuter’s Handbook : Gear You Need, Clothes to Wear, ips for traffic, roadside repair.Robert Hurst. FalconGuides, 2013. A short guide with tips on commuting by bike. Land of Second Chances : The Impossible Rise of Rwanda’s Cycling Team. Tim Lewis. VeloPress, 2013. Tells the story of cycling in Rwanda and olympic cyclist Adrien Niyonshuti. Cycling Anatomy. Shannon Sovndal. Human Kinetics, c2009. What moves when cycling, and tips for anatomy based training. But four hours is a long time for a library program. We asked our presenter to condense the course down to two hours. We held our Urban Bike Skills program on a Saturday, from 12:30 to 2:30 and attracted 24 patrons. We specified that the program was for adults and teens and while the majority of attendees were adults, one woman did bring her two children who bicycled (one a young teen and the other who was probably around 7 or 8). The 7 year old had a little trouble sitting quietly, but our AHC policy (Always Have Crayons) helped. Our former mayor (and current city councilman) also attended, which was a nice addition, and I even had a few patrons who couldn’t make it contact me to ask if we were going to do the program again. The presenter spent the first half hour talking with participants about why they were at the class. She got a variety of answers, but most wanted to feel safer in traffic. The mother with children said that her oldest already biked everywhere, so she wanted to understand what he needed to do to be safe. The personal information shared by people at the beginning of the program—wanting to feel safe, wanting more information about biking—as well as the inquiries about offering the program again made it clear that there is a need for this kind of information in the community. The mother attending with children makes me think that bike skills would be an interesting family or all-ages program and I can see a really positive outcome in all members of a family having the same understanding of bike safety and learning skills together. bikers can stop and get snacks and swag. Our city traditionally runs an energizer station and does a few extra things to encourage city employees to bike to work—a group photo, a lunchtime Bike with the Boss ride, and prizes for people who bike the farthest. 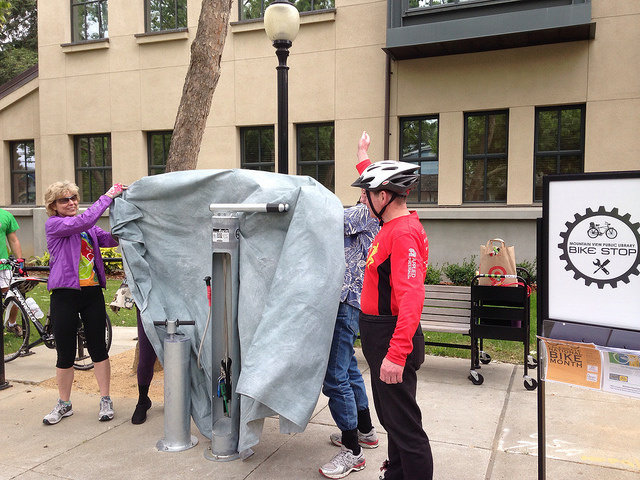 The library decided that this would be a great day to officially unveil the Dero FixIt station. Our city manager ended his Bike with the Boss ride at the Fixit station and several city council members also attended, as well as members of the public. We set up a table with granola bars, water, and Library Bike Stop stickers. We also invited a couple “fixers”, to do tune ups for people. One fixer came from our local non-profit, The Bike Exchange, which rehabs and then distributes bikes to low income individuals. He was able to provide expertise about how the tools on the Fixit station should be used, and shared his experiences as a longtime local biker. The other group of fixers were from Bay Area BikeMobile, a regional non-profit which will go to schools, libraries, and other organizations to provide free bike tune-ups. Although they are primarily youth and family focused, they also help adults and are really a lot of fun. The event provided an opportunity for a lot of great casual conversation between bicyclists and city council members (some of whom are also bicyclists). One barrier to riding everyday is the fear that one’s bike will be stolen. We asked our police department to put together a program about keeping bikes out of the hands of theives. Our Press Information Officer, Sergeant Saul Jaeger, put together a great presentation. He provided lots of great tips and answered audience questions. Riffing off the success of Bike to Work day, in 2014 the Silicon Valley Bike Coalition launched Bike to Shop Day. So of course we had to participate! Spearheaded by Janet Lafleur, who led our Shop by Bike workshop, Bike to Shop day asked local businesses to provide an incentive for people to do their errands on their bikes. The library offered bookbags to the first 50 people to show their helmet and library card at the 2nd floor reference desk. 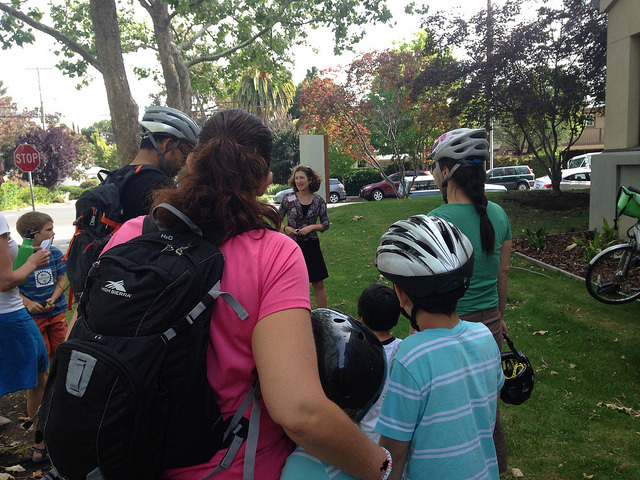 On this day we were also the gathering point for a shopping themed Kidical Mass (Mountain View’s family bike ride). The League of American Bicyclists have a standard road skills workshop, which is designed to follow their four hour classroom workshop. We held our road skills workshop a couple weeks after our classroom skills workshop, which was a prerequisite. We asked our instructor to again shorten the workshop down to two hours. Following a brief review of the information from the classroom workshop, the first part of class was drills which was followed by a street ride. We held the class on a Sunday morning before the library opened, blocking off the surface parking lot for the drills portion. 8 people attended and it was great to do an outdoors, move-around library program. Hitting the streets also gave us an opportunity to do a little library marketing—people were curious about the ride, and when we stopped at our Dero FixIt station, I was able to talk to passersby about our bike programs. These programs provided a great opportunity for the library to engage the community and increase public safety. We’ve connected with lots of great people and turned the library into a hub of cycling information which will doubtless serve us well in the future! The next post in this series will focus on Bike Maintenance and Repair class which turned into a regular Montly Bike Clinic. Editor’s Note: This is the third Mountain View Public Library Bike Stop blog post focusing on the results of their Pacific Library Partnership Innovation and Technology Opportunity Grant Program. 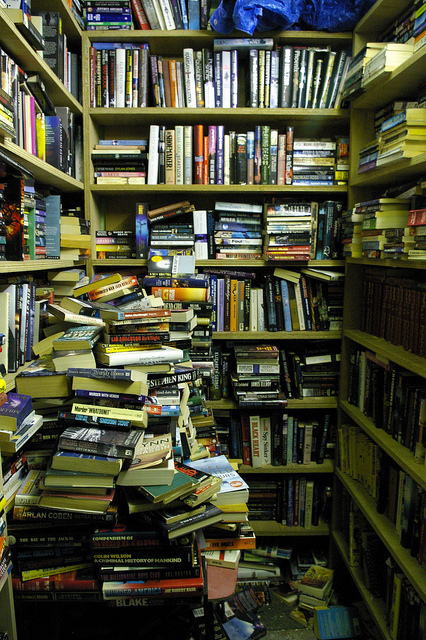 This series is written by Emily Weak, Adult Services Librarian at Mountain View Public Library.